An extensive evaluation of Cuba’s centralized electricity generation system was conducted under the support and guidance of the United States Agency for International Development (USAID). The energy modeling exercise was performed to identify cost effective future options for electricity generation in Cuba. Calendar year 2007 was chosen as the base year with modeling periods of three-year intervals through calendar year 2025 (i.e., 2010, 2013, 2016, etc.). The MARKAL (MARKet ALlocation) energy system model served as the analytical platform for evaluating the future energy options for Cuba. A comprehensive literature review was conducted prior to the model development. The option of verifying the peer-reviewed literature with in-country energy experts was not within the project scope. This MARKAL analysis of the Cuban power sector was conducted as a component of a larger study on future energy options for Cuba, which is an island nation with an isolated power sector. The nation’s energy system has been shaped by unique circumstances— unusually low participation in the global economy and dependency on external support, particularly in the form of subsidized oil. Centralized electricity generation relies primarily on a set of aging heavy fuel oil power plants whose condition has been compromised by the burning of heavy, high sulfur domestic crude. The fuel source for some of these aging power plants has recently been supplemented by natural gas, thereby making them low efficiency dual-fuel plants. International joint ventures have financed a limited number of new grid-connected natural gas-fired power plants. Electricity demand is growing at a faster rate than the supply capabilities of the aging generation, transmission, and distribution system, thereby necessitating distributed generation. More than 1 GW in small diesel- and fuel-oil-fired gensets have been added as distributed generation. Going forward, the electricity generation system is subject to a large number of uncertainties. Some uncertainties, such as the deterioration of the transmission and distribution system, rate of economic growth and international fuel price uncertainty are faced by all countries. Other uncertainties such as the rate and nature of market liberalization, openness to and availability of foreign investment, and changes in the structure of energy demand, are specific to Cuba. As a relatively simple system facing many uncertainties, the Cuban situation represents an opportunity for indepth scenario analysis. The goal of the analysis was to identify cost effective power sector investment options under various scenarios of electricity demand growth, oil and gas production, and other key energy system variables over the period 2007–2025. The key uncertainties were divided into two scenario sets or “storylines.” The first set of scenarios develops a business-as-usual (BAU) case. This group of scenarios assumes continued moderate electricity load growth, limited foreign investment in the oil and gas sector, and hence limited domestic fuel production growth. The second set of scenarios evaluates higher growth (HI) scenarios. 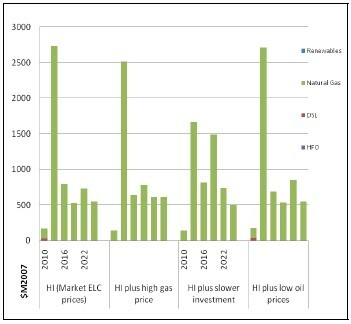 The HI scenarios assume rapid economic and electricity demand growth, high foreign investment, rapid increase in domestic fuel production, and a transition to market pricing of electricity. Within each scenario set, sensitivity analyses were conducted on key variables, including higher gas prices, lower oil prices, restrictions on the rate of new power plant and LNG import infrastructure investment, and high bagasse availability due to a revitalized sugar/ethanol industry. Given the multidimensional uncertainty, the robustness of the key results is surprising. Natural gas is the most cost effective fuel for Cuba absent free or deeply rebated oil. This finding remains true even in cases where natural gas prices are increased 40% above the U.S. Energy Information Administration’s (EIA) Annual Energy Outlook 2009 (AEO2009)2 projected levels and oil prices are decreased 40% below AEO2009 levels. Thus it is cost effective to replace the existing heavy fuel oil plants with new natural gas combined cycle plants as quickly as possible. This is due to the low efficiencies, limited availabilities, and high maintenance costs of the existing generation plants. Sensitivity analysis found this conclusion to be robust even when maintenance costs on the existing plants were reduced by 50 percent. Given the robustness of this result, the key variable becomes access to natural gas. Natural gas is either available through domestic production or by importing LNG. Data for LNG infrastructure and import costs were derived from EIA estimates for state-of-the-art facilities in the U.S. and Japan. Given these assumptions, importing LNG is cost-effective in every scenario, suggesting that further examination of site-specific costs is an important area for future study. Restricting the ability to import LNG substantially increases system costs in every scenario. When LNG import is denied, wind and bagasse (sugarcane residue) resources become valuable renewable energy resources, while these technologies play a minor role in all of the nonrestricted scenarios. A second key consideration is how rapidly the replacement of the existing plants can realistically be conducted. In the HI growth case, the unconstrained system builds nearly 3 GW of gas combined cycle in the 2012–2014 period at a cost of $2.5 billion. This construction rate may well be unrealistic. Various restrictions on the speed of this replacement were imposed in the model. These restrictions were a primary determinant of system costs and electricity prices. An overview of these various investment profiles are shown in Figures 1 and 2. Current electricity tariffs are subsidized at an average cost of $0.13 per kWh, or somewhat more than half the estimated current costs. A variety of scenarios that endogenize demand response to price liberalization were explored. The observed effect is a reduction in near-term demand. Once the system has completed the replacement of existing plants, subsidies are no longer needed to maintain electricity prices at or below current levels. In the BAU scenario, limited growth of domestic gas production causes the energy system to be very sensitive to changes in external conditions. A 40% increase in gas prices increases system cost by 15 percent and an inability to import LNG increases system cost by 50 percent. In the latter case, the system maintains the more efficient existing heavy fuel oil plants and builds a combination of new heavy fuel oil steam, wind, and bagasse. When the rate of new investment is constrained below the 2.5 GW built in 2012–2014, existing heavy fuel oil plants must continue to operate for some time as the gradual turnover takes place. Fuel expenditures jump in 2010, as Venezuelan oil subsidies are assumed to expire. Switching to natural gas-fired plants enables a dramatic drop in fuel costs, even in the high gas price case owing to the substantial overall efficiency gains. Limiting access to imported LNG greatly increases fuel costs as reliance on heavy fuel oil-fired generation is extended. However, a revitalized bagasse-to-energy industry mitigates this effect by eliminating the need for imported petroleum by 2020. 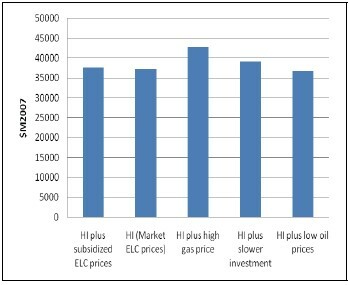 In the HI scenario, system costs are sensitive to increases in natural gas prices and restrictions on the rate of investment in new power plants, but the effect is less pronounced than in the BAU case. When electricity subsidies are removed, demand growth moderates, but only slightly. The effect is most pronounced in the middle periods (2016–2022) if the replacement of the existing plants is slowed by constraining investments. Once the transition to new generators is complete, lower than average market prices lead to minor adjustments in demand. Only restriction of new investment or denying LNG imports significantly raises prices above this level. Unlike the BAU scenarios, rapidly expanding domestic gas production in the HI scenarios enables system reliance on gas even in the absence of LNG imports, with a minor role for wind and bagasse. However, higher costs lead to a downward adjustment of demand in response to market prices, suggesting that end-use energy efficiency potential and cost are also important variables for study. As in the BAU scenario, the switch to natural gas in the HI scenarios enables a substantial drop in fuel costs. However, higher demand growth leaves the system vulnerable to increases in natural gas prices, which substantially increase fuel costs. 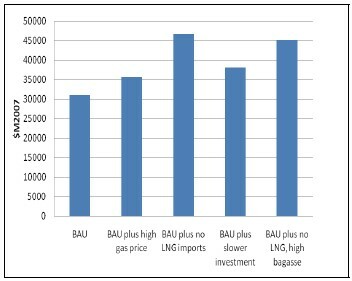 In the HI scenarios, higher domestic production of natural gas when compared to the BAU means that the system gets the majority of its fuel from domestic sources, improving energy independence and reducing energy security vulnerability. Imported coal was not found to be a cost effective option, except in the case of a high gas price (40 percent above the assumed price) and a 20 percent decrease in the assumed international coal price. These conditions induce the replacement of imported LNG with imported coal. A snapshot of the cost implications of these various alternate future paths can be seen in Figures 3 and 4. In both scenarios, the replacement of the existing plants leads to a sharp drop in carbon dioxide (CO2) emissions. Fuel switching and improved energy efficiency will also reduce air pollutants such as sulfur dioxide, nitrogen oxides, and trace elements found in heavy fuel oil. However, steady growth in natural gas consumption brings the HI scenario CO2 emissions to 2010 levels by 2022. In the HI scenarios, emissions are projected to continue to climb above 2010 levels in 2025. Ambient air pollutant emissions will likely remain below 2010 levels due to the fuel switching. Nitrogen oxide emissions may increase; this is dependent on combustion configuration and pollution control devices. In the BAU scenarios, CO2 emissions are dramatically reduced in the 2013 period because of the transition to new natural gas combined cycle power plants. Carbon dioxide emissions do not return to 2010 levels throughout the remainder of the analysis period. In all of the BAU scenarios, 2025 emissions reach at most 86 percent of 2007 levels. Ambient air pollutants are slightly more difficult to predict in the BAU scenarios. 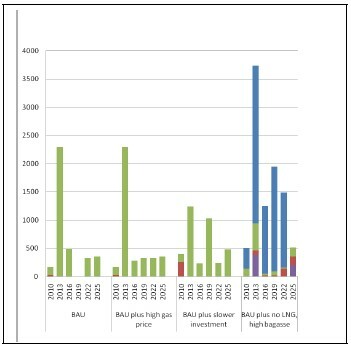 The BAU plus slower investment scenario and the BAU plus no LNG high bagasse scenario will have less of a reduction in ambient air pollutants due to the continuation of heavy fuel oil combustion beyond 2010. Emission levels are dependent upon fuel quality, combustion configuration, and pollution control equipment. Only in the renewables-heavy, LNG restricted BAU scenario are CO2 emissions reduced dramatically and continue to remain flat. Cuba’s centralized power grid will undergo substantial changes within the next 15 years. The aging power plants have been operated beyond their useable lifetimes. Within the next decade Cuba will need to make substantial investments in the centralized power system as well as the transmission and distribution network. This analysis suggests that natural gas is a cost effective fuel under many scenarios and the growth of domestic gas production and/or access to LNG are key determinants of future costs. Key areas for further study are: (1) the cost and potential for future access to gas through domestic production and LNG import; (2) the feasible rate of power plant replacement; and (3) the potential for price-responsive demand adjustment through end-use efficiency. 1. This analysis was conducted by International Resources Group for the U.S. Agency for International Development. The views reported herein do not represent the opinion or policy of the U.S. Government. Profile for Adam Chambers coming soon.